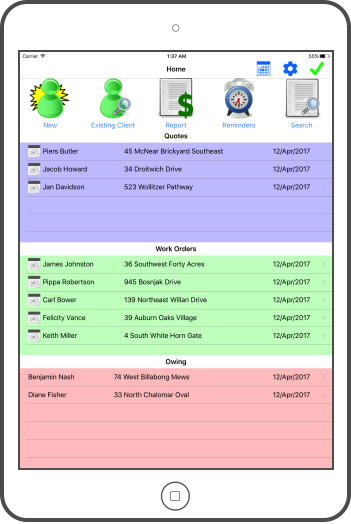 LeafBook is a simple but powerful tool created to assist tree care companies with their administrative work. The app allows you to quickly create professional quotes and will follow the job through every step of its life cycle. While the app itself is in English, it can send emails & documents to clients in either French or English. You will also be able to create formulas to automatically calculate the cost of services. These formulas can either be based on the DBH, the DSH, or on a user defined variable, such as hours of work. Everything is stored on your iPad, meaning you won't suddenly lose access to your information simply because you are in the middle of an area without internet access. LeafBook comes with a one month free trial, after this you may purchase a monthly auto-renewing subscription through an In-App Purchase. You will need the subscription in order to create and edit files. Once the subscription expires you will still be able to view your work.